Teaching at Chavagnes is more than just a job. It is a vocation, whether it be for a short time or for many years. We welcome enquiries from university graduates interested in exploring a teaching vocation and from experienced teachers seeking a supportive Christian environment in which to work. Chavagnes International College is an insitutional member of the College of Teachers (London), the world’s oldest professional body for teachers. We abide by the College of Teachers Code of Practice. Our current teachers are listed here. – Qualified and experienced practitioners with full or part-time teaching contracts. Generally these teachers live outside the College, but play a full part in its life and mission. Recruitment is in line with French employment legislation. 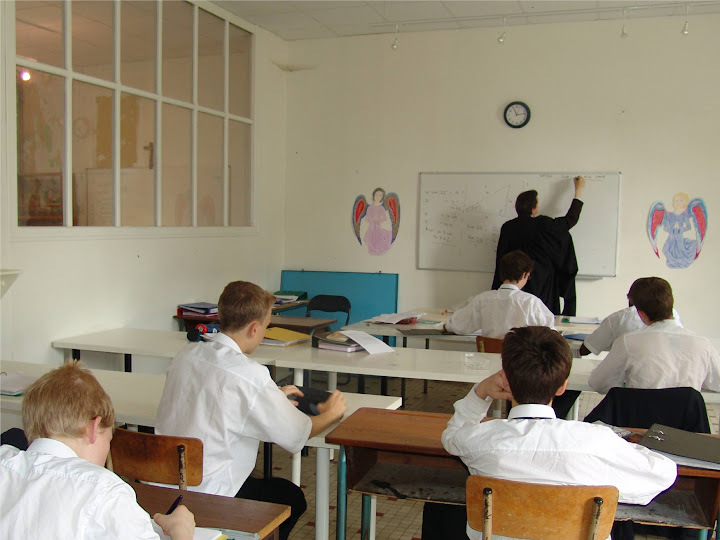 – Members of the resident community of Fellows who teach, live and pray with the pupils. Interested candidates should be single, male, committed Catholics with a university degree. Suitable aspirants without teaching qualifications are trained by the College in conjunction with the University of Buckingham. Commitment is for one year at a time. Fellows are housed in the College and receive meals during term time. They also receive a monthly stipend. – Various local volunteers who help out for short periods of time each week, in specific fields.